Inside Hachikura – Origata Gift wrapping central! First off is Hakkaisan’s Hachikura. This is a beautiful gift shop housed in a old snow country house. 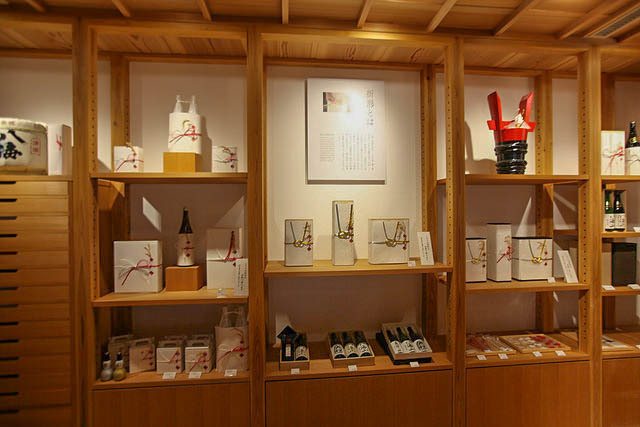 Primarily, here you can buy all manner of Hakkaisan-produced goods… of course the full range of sake, but also fermented foods, sake cups and glassware, sake cosmetics and more. However, the Hachikura is not just your regular gift shop. They offer a service that is becoming more and more rare in Japan: Origata gift wrapping. Origata is a type of beautiful Japanese gift wrapping that uses a single sheet of paper with folds to wrap a gift, highlighting it’s shape. To hold the paper in place, Mizuhiki cords tied into knots are used. Mizuhiki is a type of stiff washi paper cord and each type of knot has its own colors and symbolic meanings. 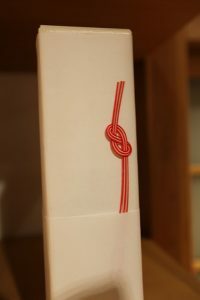 For serious gift giving occasions such as New Year’s day, weddings, births or funerals, gifts can be purchased at Hachikura and then professionally wrapped using Origata methods featuring the beautiful Mizuhiki knots. 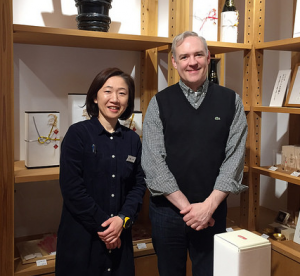 The options and meanings of the different knots are staggering, so I asked Hachikura Manager Ms. Kitsu to be my guide. She explained the process and some of the basic meanings to me. First, a base paper is selected and this paper is used to wrap the item using folds alone with no cutting of the paper. Interestingly, the paper wrapping itself is used to emphasize the shape of the item, not to hide the contents of the gift as we do in the west. The next option is to select a knot to secure the paper to the gift. Awajimusubi. Pulling on this knot brings the circles closer together symbolizing close relationships. The first knot I learned about was the “Awajimusubi”. This is a type of knot that can be used for both happy and sad occasions. It represents a close relationship that cannot easily be undone. When you pull on the ends of the strings, the knot is pulled tighter together symbolizing a closer relationship between the gift giver and receiver. Hanamusubi. 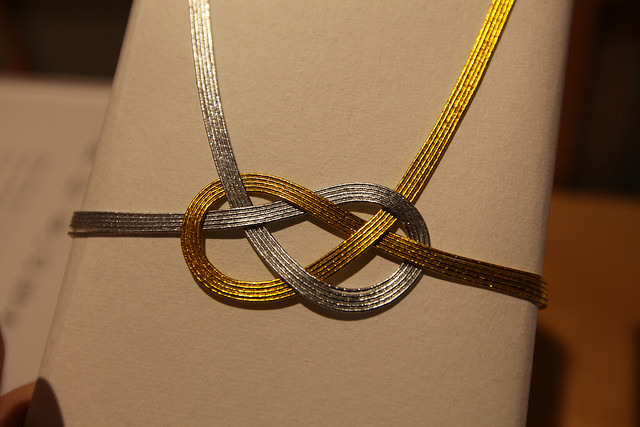 A knot that can easily be untied – a symbol for happy events you hope to repeat many times. The rice stalk is a hint to the contents inside. Next I learned about “Hanamusubi”. This is a type of knot that is used to tie gifts for a happy occasion you wish to repeat, such as the birth of a baby. This type of knot is tied in such a way that it is easy to open when pulled, allowing for that happy event to happen again. 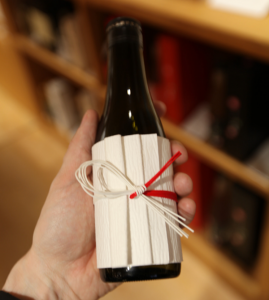 Based on the shape of the package there are two types of Hanamusubi – flat items have two ends of the knot to pull while round items, such as a bottle of sake(!) have a single end to pull, allowing you to hold the item while opening. Kitsu-san showed me that Hakkaisan also has it’s own original knot – the “Figure 8 musubi”! 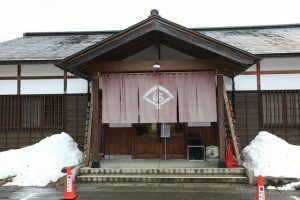 This knot is shaped like the number 8 and is meant to represent Hakkaisan (8 peaked mountain) after which Hakkaisan sake is named. It is simple and beautiful! Hakkaisan’s Figure 8 Musubi. A decorative knot symbolizing 8 peaked Hakkaisan Mountian. 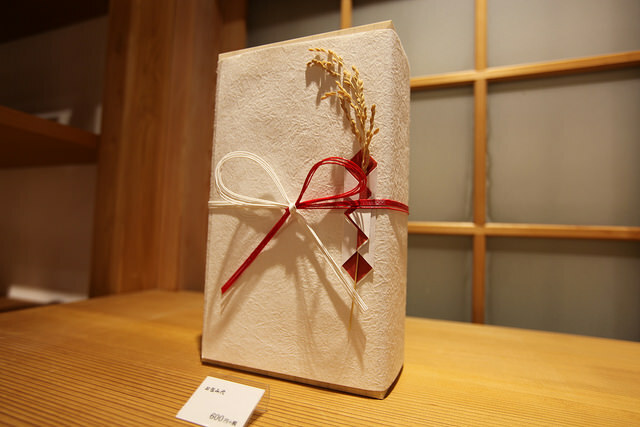 Gifts wrapped at the Hakkaisan Hachikura also often include a graceful stalk of rice grains slipped in behind the knot. 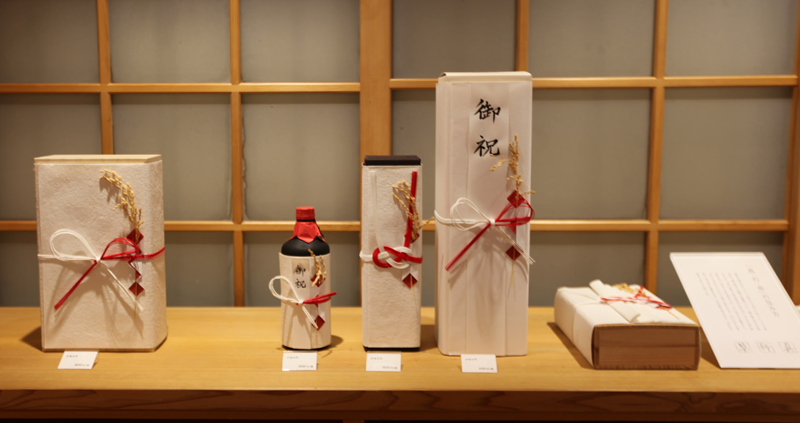 This is a symbol of the gift’s origin – with sake and our fermented goods of course coming from rice! The array of wrapping styles on display is beautiful. I can imagine if I received a gift wrapped in the Origata style, I would be very impressed. The simplicity and thoughtfulness of such gift wrapping is really beautiful. Going to these lengths to wrap a gift with such great attention to the paper, knots and colors is a sign of respect for the receiver of the gift. When I think about some of the wrapping jobs I have done on Christmas or birthday gifts to friends and family in the past, I shudder to think about the amounts of scotch tape I used to hold the whole thing together. This visit to the Hachikura has inspired me to try Origata wrapping myself the next time I have to give a gift! And there is no better way than that to wrap up this blog post. This entry was posted in Tim's Corner on January 27, 2017 by hakkaiedit.